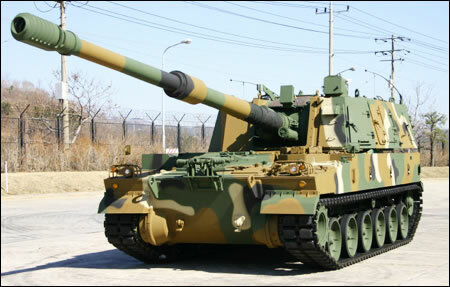 South Korean firm Samsung (Techwin Defence Program Division) was an experienced licensed manufacturer of the US M109 (A2), producing over 1000 vehicles under the designation K55. Samsung went on to develop a prototype that offered increased fire range and rate of fire with a greater level of mobility, which was delivered to the Republic of Korea Army in 1994. It was accepted in to service as the K9 Thunder in 1999 and continuing deliveries were made. Its not fully clear how many are in service, but its estimated there are over 400 and a total of 1100 have been ordered, with final delivery in 2018. Turkey has been building a modified licensed K9 designated the T-155 Fırtına (Storm). It contains many systems, but has a different turret design and entered production around 1999-2000. The vehicle is fitted with a 155mm bore and calibre length 52 main gun, giving it a greater range over most other SPG’s on the market. It has an elevation of -2.5 to +70 degree’s and when firing the locally developed K307 HE round, it can reach targets 40km out. The rounds are loaded automatically but the charges are manually loaded. Its maximum rate for fire is 6 to 8 rounds per minute. A sustained rate of fire is 2 to 3 rounds per minute. The vehicle is ready for action within 60 seconds! Of arriving at its firing position. Both this and the vehicles Digital Fire Control system, enables the vehicle to use an artillery technique called Time On Target. TOT is where three rounds are fired in sequence with the main gun raised to different elevations per round, so that each round takes a different amount of time from the other, but all hit the same target at the same time, causing a greater level of destruction. The vehicle can then move on AKA shoot-and-scoot. It has a .50cal K6 HMG MG on the commanders cupola for close encounters. The vehicles armour, like most SPG’s is rated for 14.5mm direct fire and shell fragments from a 155mm artillery round, giving protection from counter battery fire. The fighting compartment is equipped with NBC protection. The vehicle uses a German MTU MT 881 Ka-500 8-cylinder water-cooled diesel, which generates 1000hp. It uses hydrogas suspension, giving the vehicle a top road speed of 67km/h with an operational range of 360km. This vehicle is built on the K9 hull and is probably the most efficient of its type on the market. Nearly all ARV’s used by other nations, rely on the rear doors of both vehicles being open and the loaders moving rounds between both vehicles or the set up of some slow conveyer belt, which needs assembly and is slow, leaving the crews both exposed to attack. The K10 has a forward mounted arm which contains a conveyor belt. The driver simply manoeuvres the vehicle so that the arm connects with a receiving hatch in the K9. The crew of the K10 can simply move the rounds from the vehicles rear storage racks (which are refilled via two rear doors at another staging ground) on to the conveyor belt from within their vehicle, which then carries them to the K9, all from the safety of the K10. This means that not only are the crew of both vehicles are constantly under armoured protection from NBC, small arms and counter battery strikes, they are far more efficient as they don’t require rounds to be set down on a refill pallets etc as used by other SPG’s. The K9 is an excellent weapon system with a very good ARV. Its currently being considered by Australia for its SPG requirements.